Today I experienced the great teaching moment when one of my not so proficient students said that she can understand the grammar perfectly and that it is really easy. I was exalted. I was teaching present continuous tense and the students really liked it and at the end of the lesson they were able to form the affirmative sentences correctly. In this post I would like to share all the activities I used to achieve this. There are an infographic explaining the grammar, a worksheet and an interactive quiz. I hope you will like it. Please, if you spot a mistake leave a comment and I will try to correct it as soon as possible. Thank you. When I start teaching present continuous tense I do not present the following infographic till we finish the first exercise from the following worksheet. Once we check the exercise 1, I hand out the following infographic and ask the students to go through it and then I explain it. When I finish my short explanation I ask the students to complete the exercise 2 in the Present continuous affirmative_worksheet. We check the answers and then I explain the addition of the -ing ending. And then the students have to do the exercise 3. Here they add the -ing ending to the verbs. In exercise 4 the students are asked to write what the people and animals are doing in the pictures. Remind them not to forget the correct form of the verb TO BE in each sentence. In exercise 5, the pupils finish the sentences in a logical way using the present continuous tense. At the end of the lesson I asked my students to work in pairs and describe the picture we used at the beginning of the lesson. It worked for my class. Will it work for yours? You can start the practice session with the video guessing game. The man will start drawing a picture and he will stop at one moment. A question will appear and you should answer it. The correct answer will appear a few seconds later. Once we finish the exercises at school you can ask your students to practise the grammar at home. They can try to do the following interactive quiz. If they pass it they will be given a chance to play a game. The quiz is in HTML5 so it will work on all mobile devices. 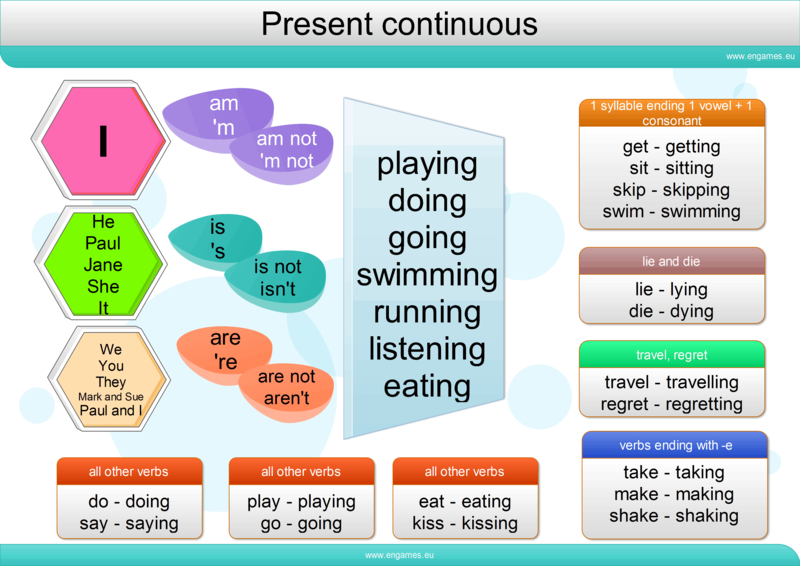 You can expand your knowledge about present continuous tense at British Council pages.